I got Loveless for a few reasons. I came out when I was 11. My mothers response was that I was going to hell and that noone would ever love me. I got it because the gay community is filled with a lot of lust and little love. Every relationship I’ve been in has been short cause they always want more than I’m willing to give. I got Loveless to remind myself not to be Loveless. I got this to go along with the “HEATHEN” written on my stomach and the “No Gods. No Masters.” written on my collarbones. But they are mostly hidden which is why I wanted my knuckles done. I don’t believe in god or religion. I live by my convictions, and I wear them on my sleeves, literally. I had been wanting to get something on my knuckles for some time now, but never really knew what to get. So I began thinking of things I would want. 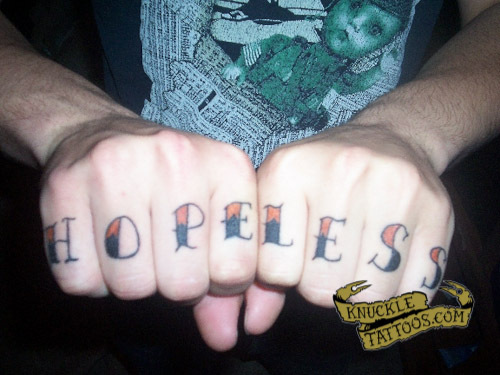 I also knew I wanted to get a Hopeless Romantic tattoo on me somewhere, because that is pretty much me in a nutshell. Honestly I am pretty sure The Notebook is my favorite movie…. I was so excited when I realize that it would fit perfectly on my knuckles, So I found the font I wanted and put a skull with a bow in with the Hopeless and a heart with crossbones in with the romantic. Kinda ties it all in together and if you just look at that finger, I like to think it says toxic love…. So keep rocking kids, the Swedes said so. My name is Osti, I’m a tattooer living in Germany. 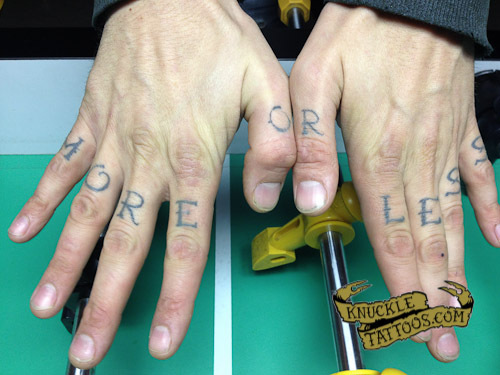 Eric Doyle did the top part of my knuckles almost ten years ago when he was working for Perfection Tattoos in Austin. He did the bottom three years ago at Jinx Proof in D.C. The tattoo is about the discrepancy between how I view myself and how everybody else sees me ;-). I had no idea how hard it was to take a picture of your own hands. Osti, we really appreciate you taking the trouble of photographing your own hands. It ain’t easy. I knew we would get knuckles from other countries, I just didn’t expect them so soon. Thanks again!